The Hermitage Piano Trio takes its name from the great Russian museum of art and culture in St. Petersburg founded in 1764 by Empress Catherine the Great. 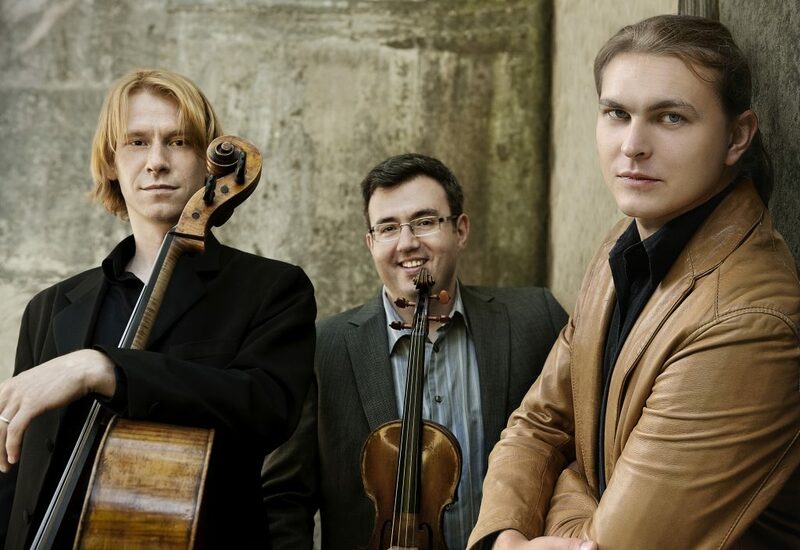 The players are Ilya Kazantsev, piano; Misha Keylin, violin; and Sergey Antonov, cello. Their concert Jan. 23 in the Flagler’s current Music Series opened with a relative novelty, Dmitri Shostakovich’s one-movement Trio No. 1 (in C minor, Op. 8), written in 1923 but not published until 1983, eight years after the composer’s death. (His Trio No. 2, from 1944, is one of his most popular chamber works.) Although plainly a student work (he was studying at the Petrograd Conservatory when he wrote it), its high quality won him a place at the Moscow Conservatory, where the Trio No. 1 received its first public performance in 1925. In it, the music of the mature composer can be clearly sensed. The Trio gave it an authoritative performance, displaying full and satisfying instrumental sonority. Ludwig van Beethoven’s Trio in D (Op. 71, No. 1) came next. The nickname “Ghost,” which Beethoven did not affix, comes from the tremolandos in its second movement, Largo assai ed espressivo, that impart a ghostly atmosphere, intensified by the tonality of the tonic minor and unusual instrumental details. That mood does not extend to the outer movements, Allegro vivace con brio and Presto, respectively, both in the tonic major, which are cheerfully energetic. However, in both, Beethoven combines rhythmic, and formal surprises with a puckish humor that foreshadows their later appearance in his Eighth Symphony. The players gave a highly pleasing account. Antonov’s cello sonority gave full value to the many solo passages for it, as did his duets with Keylin’s violin. Kazantsev’s playing throughout was on an equally high level, although some balance issues did occur due to the piano’s tendency to blur textures. Given the nature of the heritage Steinway he used, and the highly reverberant acoustics of the venue, Kazantsev seemed to be pedaling more than was ideal for those conditions. Perhaps the finale would have suffered less if everyone had played with more relaxation. Antonín Dvořák’s Trio in F minor (Op. 65) was played after intermission. Composed in 1883, this is the third of his piano trios and is the largest in scope and most intense in expression. The death of Dvořák’s mother in December of the previous year is the usual reason given for the intense sadness of the opening theme, heard in the cello, of the third movement, Poco adagio, which is contrasted with a melody of consolation, introduced by the violin. The work’s four movements mark not only Dvořák’s intensive expression in his chamber works but also an enlargement in proportion equal to his symphonic works. The opening Allegro ma non troppo opens with a questing theme in violin and cello that is soon repeated in the piano, strongly contrasting with the second subject, equally passionate, a soaring theme in the violin. The following movement, Allegretto grazioso, is a quasi-scherzo that employs a strongly accented second beat in a measure of two, in the manner of the furiant, a Czech national dance. The finale, Allegro con brio, is a lengthy rondo with another furiant as one of its episodes. Like the finale of his later Cello Concerto, Dvořák indulges in several reflective interruptions before ushering in the nine-measure Coda that end the work vigorously. Kazantsev, Keylin, and Antonov collaborated in a powerfully expressive, beautifully played account. Some blurring was present, but one listened past it to enjoy the beauties of their performance. As an encore, they played “April” from The Months (Op. 37a), by Tchaikovsky.